Just finished the jacket. Yesterday, I assembled the double-welt pockets, stitched the shoulders, added the collar, pinned in the sleeves. This morning, I sewed the sleeves in (bound the seams), stitched the sleeve underarm and jacket side seams (bound those seams), and finished with a hidden binding on the bottom edge. The buttonholes took a bit of crafting – in the end I used a double thread (a black combined with an almost navy) to provide a bit of definition to the buttonholes so they show (a single thread wasn’t really visible). Last the buttons. Then I tried the jacket on – it fit, but the sleeves were about an inch and a half too long. I removed the cuffs, shortened the sleeves and restitched the cuffs. The sleeves are now a little longer than 3/4 length – I can bring them down by lowering the cuff should I want to. I’m pleased with the result. It fits like the jacket I bought in San Francisco three years ago – a useful addition to my wardrobe. There are lots of ways of constructing a double-welt pocket. I never attempt one without first doing at least one test run! Here’s a sample I mocked up late yesterday. I want the pocket opening to be on a slight diagonal rather than cutting straight across (this way I can make a wider opening in a shorter width distance). The 1/4″ welts are small but set up a stabilizing contrasting detail against the very busy fabric. In this practice pocket I didn’t interface the welt fabric – I need to do that and I need to use a small (slightly stiff) interfacing on the jacket fabric itself so that the pocket opening is crisp and flat. 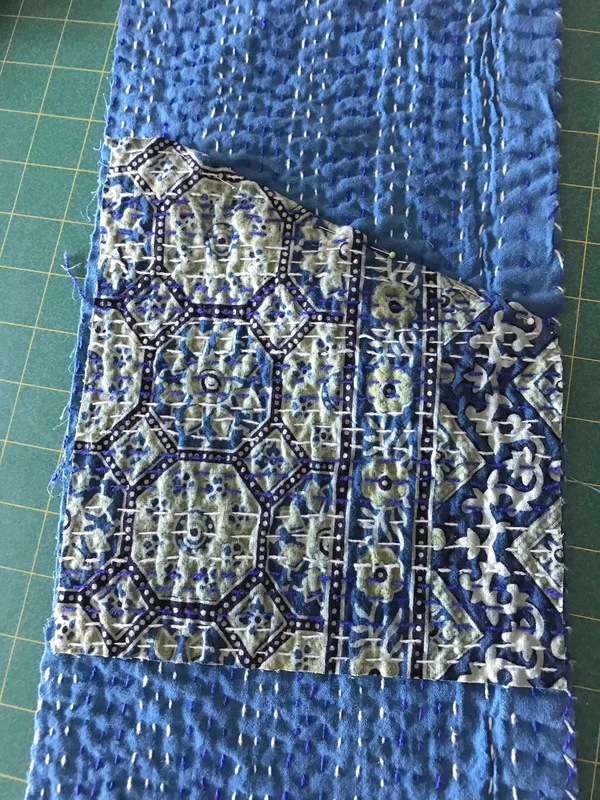 A normal double-welt pocket uses a pocket bag – but because I want to use patterned fabric on the inside as an accent to the solid of the reverse of the jacket fabric that won’t work – too much bulk. Instead, I’m going to cut out a single piece for the pocket, do a Hong Kong finish around the edges, attach it to the inside of the top welt fabric, then straight stitch the pocket piece to the front forming the pocket. 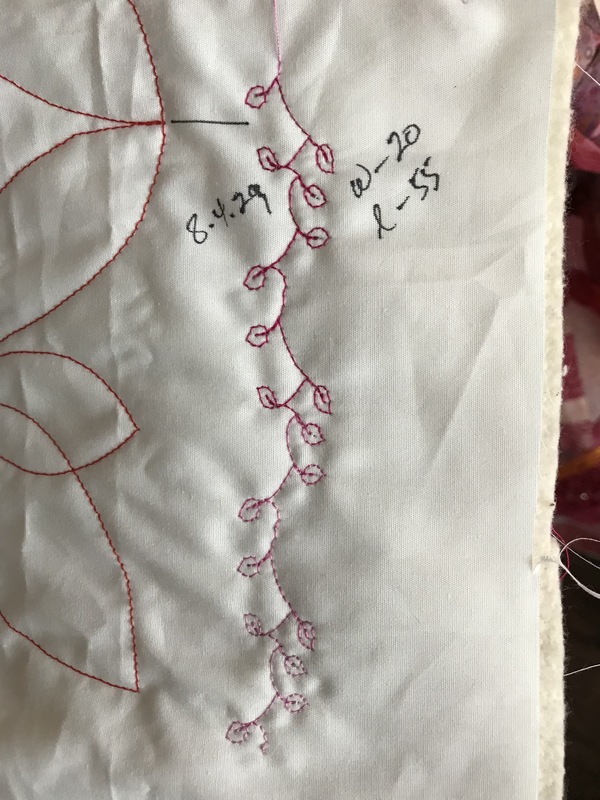 In addition, I’m going to position the top of the pocket piece to match the angle of the double welt and align the pocket piece on the vertical. I used the dimensions suggested in Andrea Brown’s tutorial – begin with 7″ x 3″ welt pieces. But the resulting 5″ opening is a tiny bit too narrow. I want to end up with a 6″ opening which might actually bring the pocket to the side seam – or very close to it. But because the welts are small, that should look OK.
Now to add the pockets to the jacket front pieces – easier to do before they’re attached to the jacket than after the parts are sewn together. Finished this pair of socks last evening. 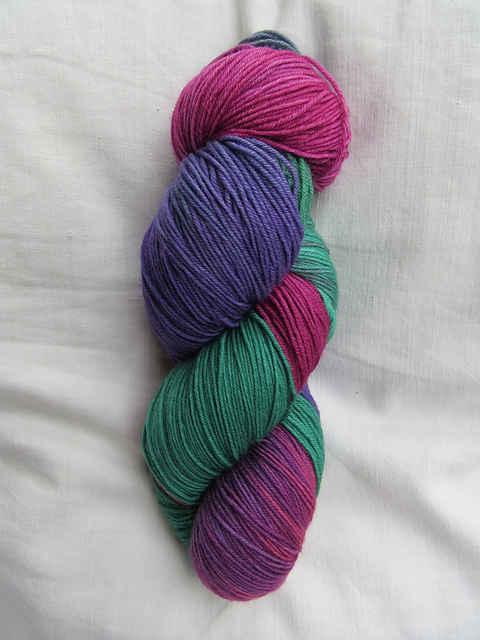 Too bad I didn’t take a photo of the skein – the colours were luscious – and distinct. 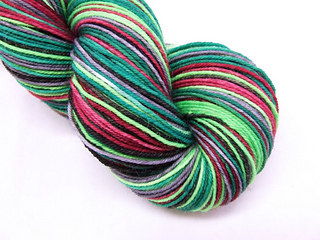 But unwind and ball the yarn and you get this kind of blurred mixture which is relatively boring when knit into socks. I tried choosing embedded colours for cuff, heels and toes but they don’t blend – they stick out. In either case, they knit up looking more or less like my socks. While the colours are enticing, I find this yarn much less satisfying to use than commercial balls dyed to create an actual pattern. Socks with hand-dyed yarn always seem to take a lot longer because there are no pattern shifts to indicate the progress you’re making. So back to another patterned ball of yarn…. Last spring in San Francisco, Sheila and I visited Gumps. At the front of the store was a rack of lovely casual bright print jackets by Meiko Mintz constructed out of Indian Kantha cloth. I didn’t bother trying them on – the price deterred me. The jackets were something I could easily make for myself (if I could ever find the quilted Kantha cloth). 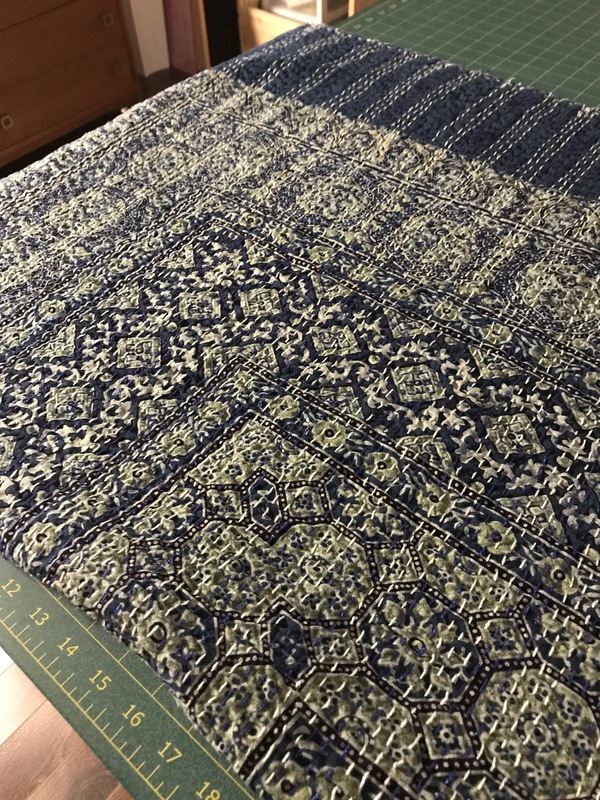 A couple of weeks ago, I came across an inexpensive king-size Kantha bedspread on Amazon which I ordered. It arrived amazingly fast – within 10 days. More than enough fabric to make a jacket. First it had to be washed… I thought about the process for more than a week – I knew the indigo (or whatever dark blue dye had been used) would run and likely kill the white stitching which I didn’t want to happen. I was able to fit the large bedspread in my home washing machine. 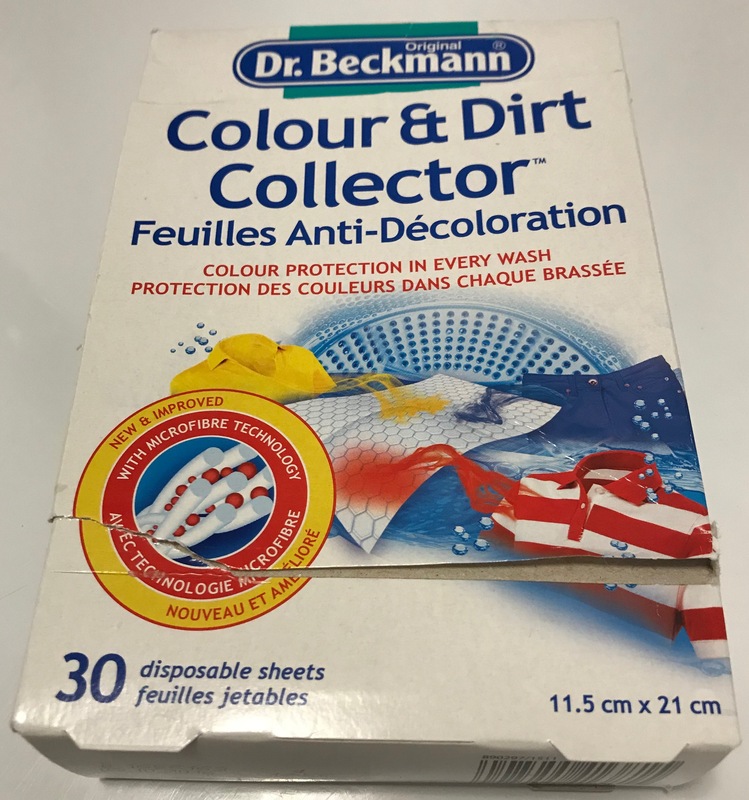 I added colour collector sheets to the wash. I used four just to make sure I would catch as much loose colour as possible. I added some Oxyclean (to get rid of whatever dirt was in the fabric), and an unscented detergent to cool water. (I probably should have added a cup of vinegar but I wasn’t sure how it would react with the Oxyclean – I will hand wash the jacket with added vinegar once it’s done to stabilize the colour before wearing it). 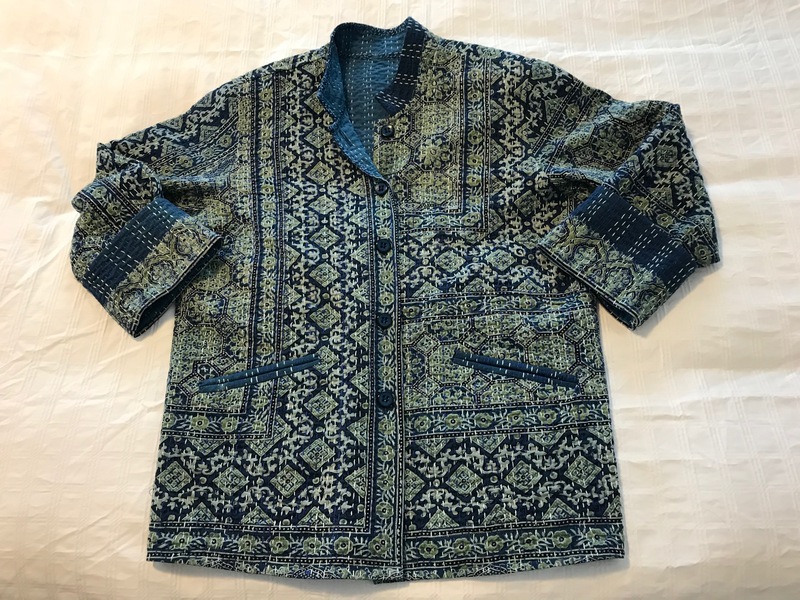 I started the garment by making a pattern from an existing jacket (which I happen to have bought at Gumps three years ago). 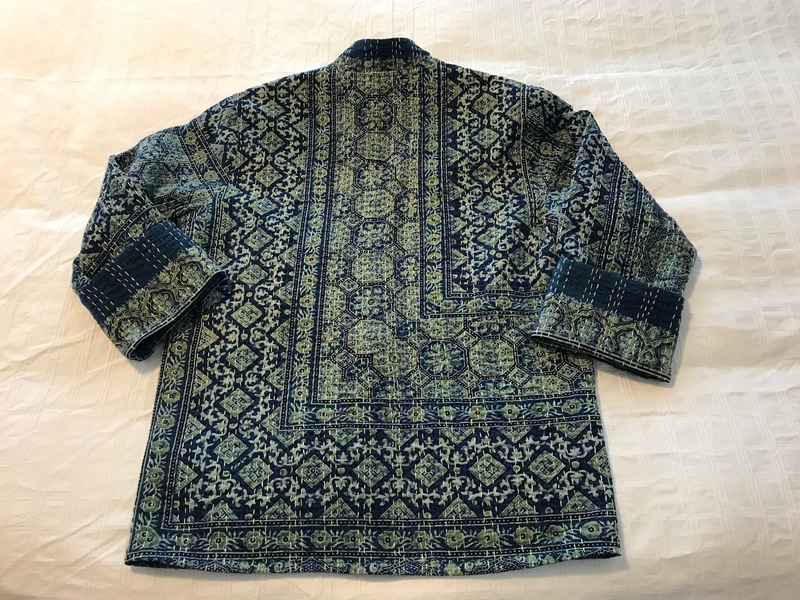 A simple style with a Mandarin collar, turned up sleeves, pockets (too small to be useful – mine will be quite a bit larger). The thing about the jacket, which is reversible, is it’s finished with a hidden binding. 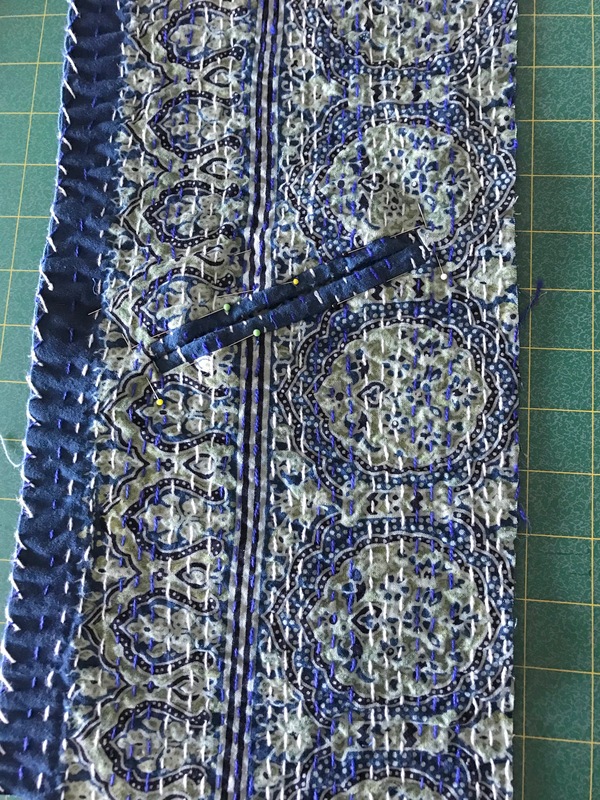 Because my fabric is already quilted I will do a hidden binding finish using a batik that complements the plain fabric on the back of the bedspread fabric. Here’s the jacket cut out and ready to begin sewing (I’ve already added the turned up cuffs to the sleeves – I constructed them separately and attached them to the sleeves so the print shows when the cuff is rolled back). Because of the way I’ve incorporated the the fabric detail, large patch pockets would obscure the design. Instead I’m going to make double welt pockets and use a single layer of printed fabric for the pocket on the inside of the jacket, blind binding the pocket fabric, then stitching it to the front, leaving just the double welt showing on the outside of the jacket. 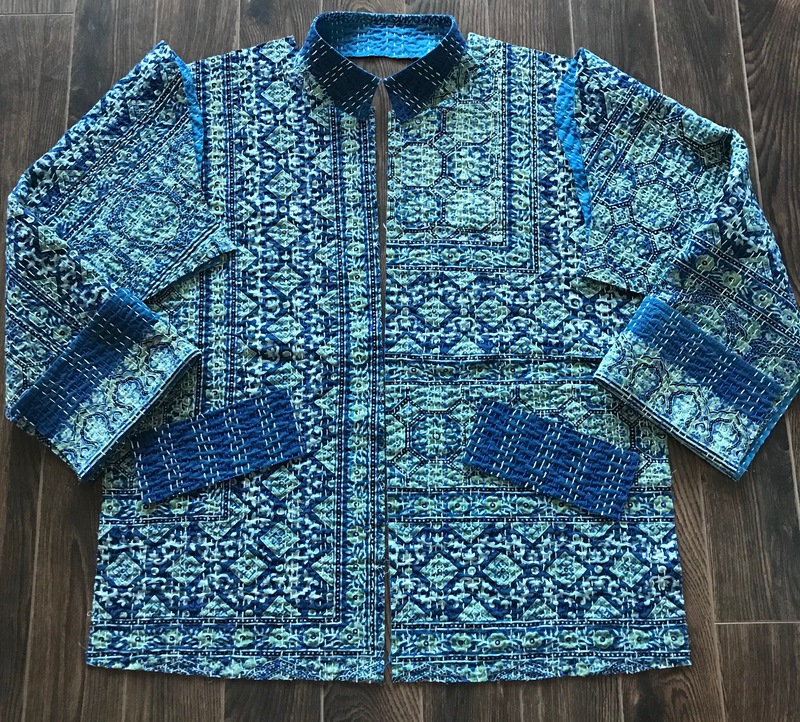 I’m still not sure whether I want to add a solid, darker blue strip to the bottom of the jacket – I have enough fabric to do that, although it would be an add-on and an extra seam – still thinking about that. The finished jacket will be just a single layer, with machine stitched buttonholes. I’ve so far not looked for buttons – have to check my button collection before I go shopping. More as the project unfolds over the weekend. 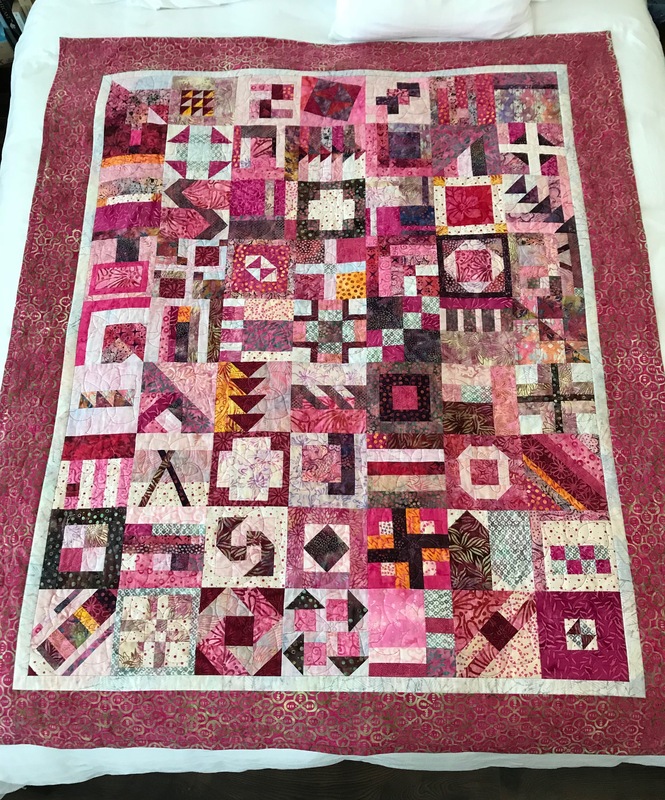 Just finished the pink quilt – I bound it in the same fabric I used for the wide border. In the end I left the narrow border alone – I began stitching the leaf motif but two repeats of the stitch and I stopped and picked it all out – the stitches weren’t quite even and it just didn’t look good. 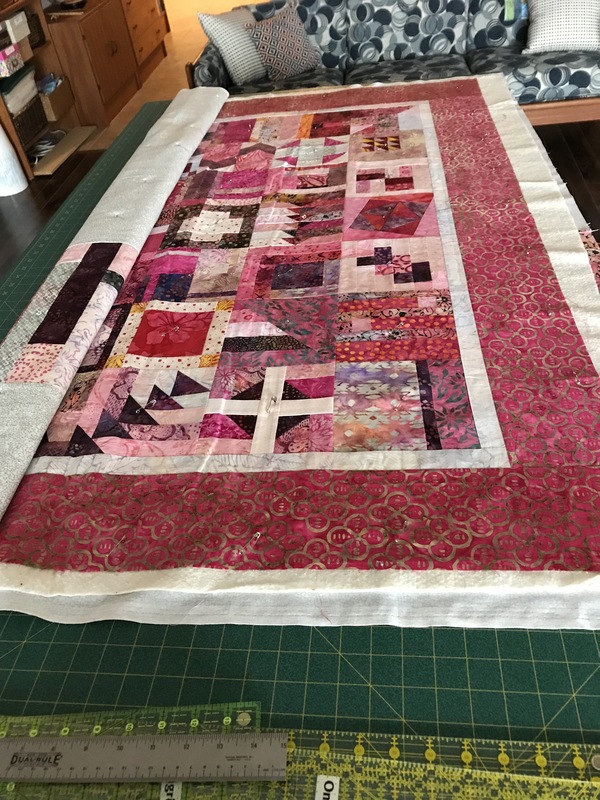 That’s likely it for sampler quilts – while I enjoyed creating the 63 different blocks, most of which I’d never constructed before, the task is time consuming because each block had to be cut out and pieced individually – couldn’t streamline the process. 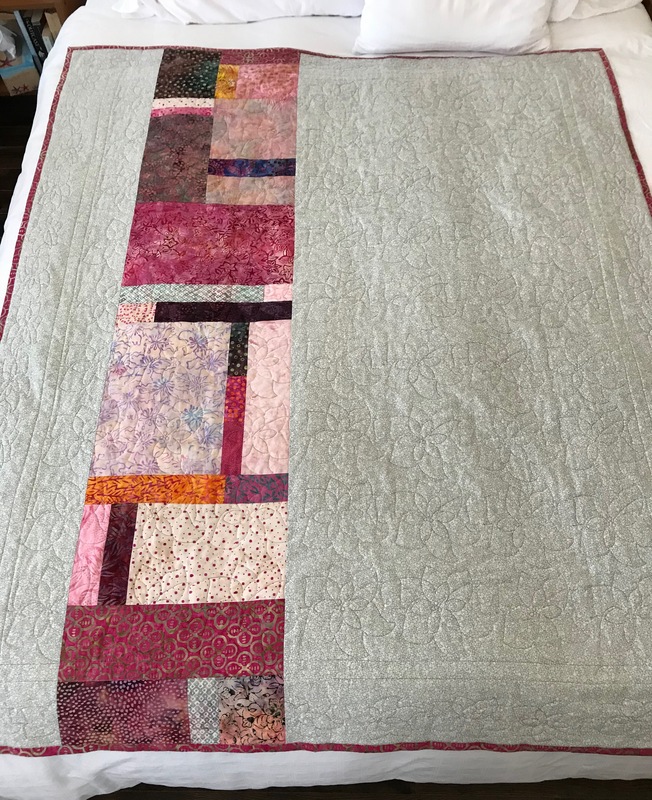 The back – because the quilt top is so busy I decided to simplify the back insert – I used large pieces broken up with strips of accent fabric. The quilting shows on the back – you can barely discern it on the quilt top. 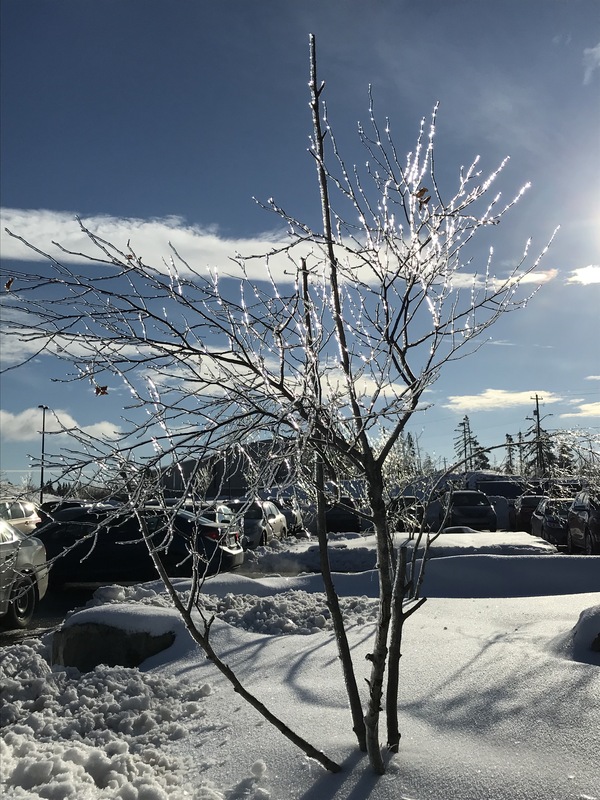 Another winter scene: Friday, after the storm – with ice pellets and freezing rain the night before – a beautiful sunny day, if cold, and the trees, shrubs, plants, grass – all sheathed in ice – a beautiful sight. This small tree made me stop and capture its image as I was leaving the pool after my morning exercise class. I tried capturing other photos but there was so much vegetation covered in ice that the images weren’t worth keeping. 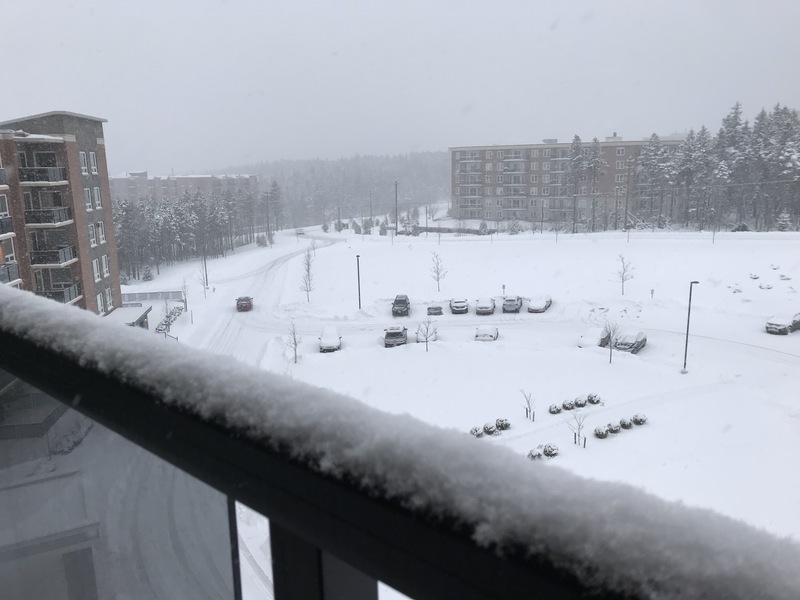 In The Midst Of Winter is actually the title of a recent book by Isabel Allende, but it’s apropos for today – snowing quite heavily right now, has been snowing all day. Expected to turn to rain during the night – the roads tomorrow will be horrendous, I’m sure. And I just checked – I have nothing on my calendar for the day so I can stay home and work on the quilt. 18 blocks embroidered/quilted yesterday, 25 completed this afternoon. That leaves 20 for tomorrow. Then I will need to stitch the narrow border and embroider the wide border – who knows, I might get all of that done by afternoon. I tested a number of decorative stitches for the narrow border – I’ve decided to use # 8.4.29 on my Pfaff Creative Icon – modified to 20mm width, 55mm length – that should complement the overall embroidery design – because the narrow border is pale I think I will use a variegated light grey thread (Aurifil 4060) which won’t show much. The pink variegated thread I’m using for the quilting would stand out too obviously. Yesterday, I dropped into one of my local sewing/quilting shops. At the counter there was a clay magnetic tool holder in the shape of a flower – I thought about buying one, but I knew I had a number of rare earth magnets on my fridge at home so I decided to see what I could create. 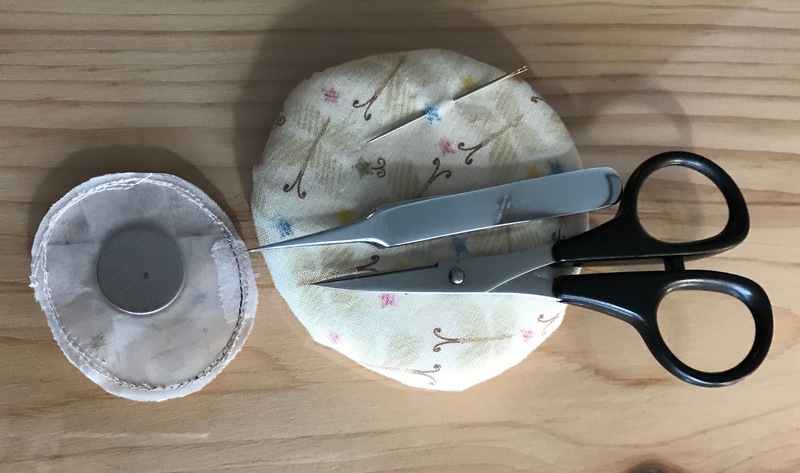 When I’m quilting I use three tools – small scissors, fine tweezers, and a self-threading needle (for burying thread ends at the start and finish of each embroidery). While I’ve always kept them close at hand on the sewing table – actually having them on my person means not having to look/feel for them at beside the machine. I’ve been wearing my improvised tool holder today while I worked – definitely useful. The holder isn’t large, but an adequate size and strong enough to hold my tweezers and small scissors. The padding allows me to store the needle while I’m working so I don’t have to hunt for it among the other stuff beside the machine! 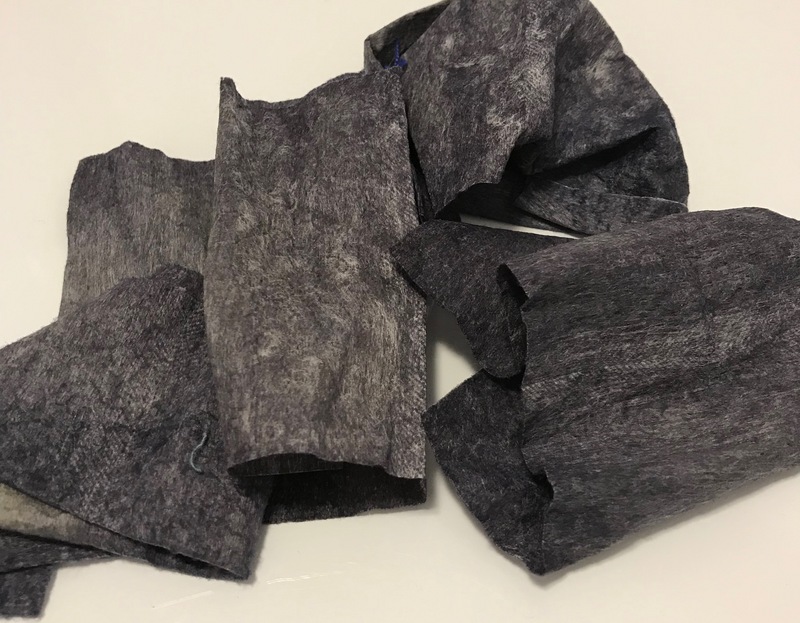 Construction: I started by cutting out a 6″ square of fabric and batting, a circle from the lid of a plastic kitchen container. I taped one rare-earth magnet to one side of the plastic disc, then cut the fabric out in a circle (3/4″ larger than the plastic disc), stitched a running thread around the edge, pulled it taught and finished off with another smaller covering circle tacked over the back of the padded one. Then I embedded the second magnet between two pieces of clear plastic, taped it in place, cut out a circle of fabric and stitched the edge together. 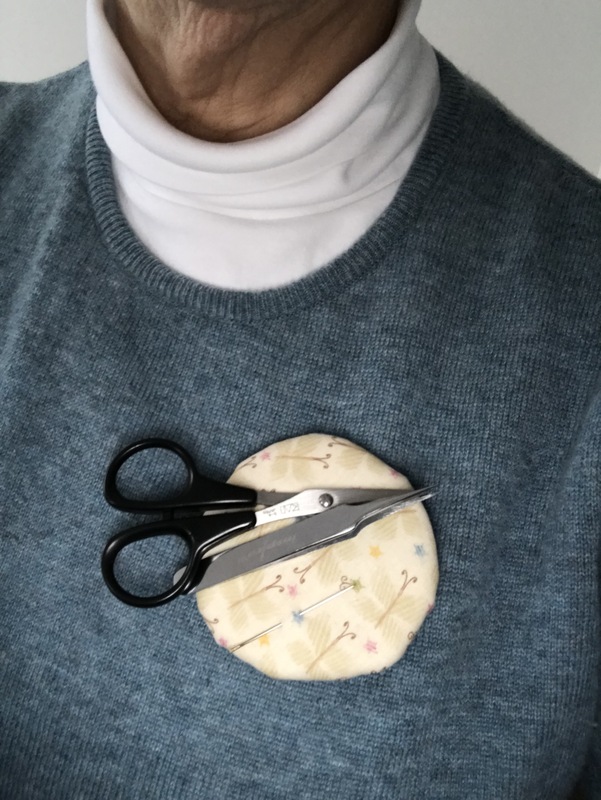 The second magnet is slipped under whatever I’m wearing to connect with the magnet on the larger, padded disc which gets worn on the outside. So back to work on the quilt tomorrow. I haven’t worked on this quilt since Dec. 31. 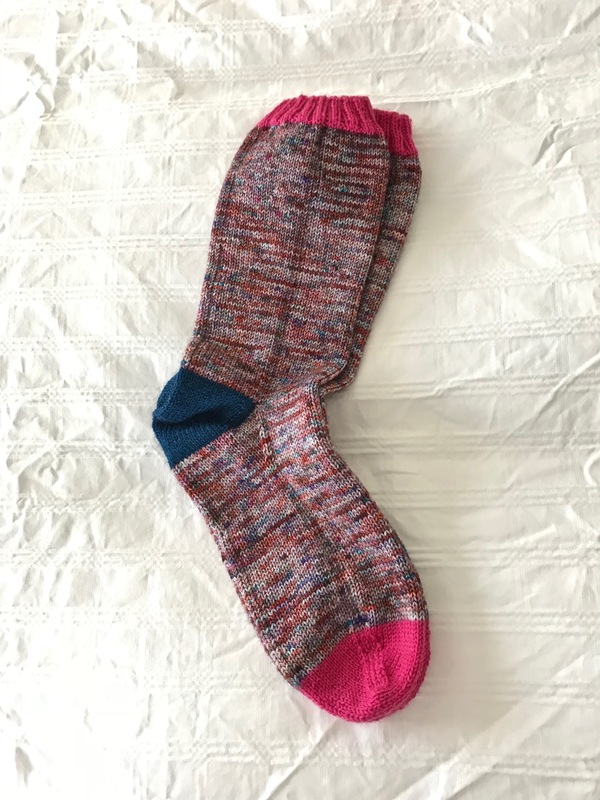 I’ve read 5 mystery novels, watched some interesting series on TV, added elastic to the bottom of two sweaters, continued repairing socks in the “repair socks” basket (five pairs completed, six left to do), knit a new pair of socks and close to finishing the first sock for another pair. But no sewing on this quilt. However, yesterday, I pieced the quilt back. Today, I pinned the quilt sandwich. Yesterday, I also set up an embroidery to fit a 150mm x 150 mm block; I still need something for the borders – I’ll probably use one of the decorative stitches for the narrow border and something related to the block design for the out border – have to do that now. And then the quilting in the hoop will begin.